While the fans at Kettler Iceplex on Thursday afternoon had their eyes focused on the two Washington Capitals first round draft picks Filip Forsberg & Tom Wilson, it was an unsigned free agent out of Umass-Lowell that had everyone saying "Who is that guy?". David Vallorani, who has progressively gotten better with each scrimmage, stepped up his game in the Thursday matchup and impressed the gallery of fans looking on from the bleachers. 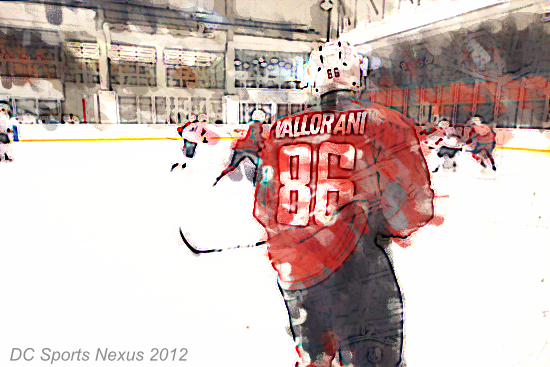 In the first period Vallorani sent over a beautiful pass to teammate Matt Bailey for the first goal of the scrimmage. In the second, the favor was returned by teammate T.J. Syner who fed the best pass of the day on a 2 on 1 to Vallorani who sank in the net. Then in the 3rd, Vallorani put in the prettiest goal of the day, a sniper shot from a bad angle that went top shelf. In an interview with Rock The Red, Vallorani set the following as his goal for camp: "I’m just looking to prove myself, show I that can be a good hockey player." So far, the 5'8" undersized forward is doing just that. Hopefully for his sake, the Capitals agree. Notes: David Vallorani played four seasons at the University of Massachusetts-Lowell where he finished 5th on the team in scoring in 2011-12 with 29 points. The senior was a shooting machine, leading the team in shots on goal with 119. Vallorani went undrafted and was invited to Caps D-Camp as a free agent.